Jimi Hendrix Week: Jimi lives! Many guitar players want to sound like Jimi Hendrix. John Campbell actually gets to 'be' Jimi Hendrix every time he takes to a stage. Campbell has been fronting tribute act Are You Experienced? for well over a decade, playing shows across the UK and mainland Europe. One fan on his website writes: "I saw Jimi Hendrix back in 1969 but I have to say he didn't sound nearly as good as John does." Now, that is missing the point by a million miles, but for Jimi Hendrix Week on MusicRadar, there's possibly no-one better alive to talk through what it takes to 'be' Jimi Hendrix. What's so special to you about Hendrix? "Jimi Hendrix to me was, and is, my biggest guitar playing influence. I am constantly amazed when listening to his music, that it still sounds so fresh. He was and remains totally unique in his field. I doubt we will ever witness another musician who will arrive with such impact again." When did you start "being Jimi Hendrix"? "I formed Are You Experienced? 12 years ago. At the time i just wanted to play the music of Jimi Hendrix for purely selfish reasons… a guitar players dream! But audience reaction changed my perspective. Reactions to gigs are always positive, although I do make a point that I'm John Campbell interpreting the music of Jimi Hendrix. "Jimi will always be iconic and cool"
"It can be embarrassing to be asked if I think 'Jimi's spirit possesses me when I play'. Huh?! I think that most bands, tribute or otherwise, who play Jimi's songs with feeling and respect will get a good reaction. He has that effect on the music loving fraternity. He will always be iconic and cool." What's the hardest thing to nail about Jimi's playing? "I've been asked this question so many times. I've heard guitarist's cover Hendrix songs and have them down to a tee, but my personal view is that they're missing the point. "To me it's all about feel. Sometimes you can lock into a song and improvise effortlessly - it just comes. Other times, you may think to yourself it's not happening. You know, the sound guy's made you turn down and you NEED the volume, the power, the feedback. Why doesn't he understand, haha! "You can learn the licks, do the tricks, but at the end of the day it's all about expressing yourself through the guitar - and just hoping the listeners enjoy the music." Do you try and stay authentic with the gear: or is it just easier to use modern technology? "I do try to stay authentic, but in the past I have experimented with modern technology. I've tried digital amps in the hope that I could achieve the overdriven power amp tone so hard to achieve with 100 or 50 watt non-master volume heads, albeit digitally. "I used a Fender Cyber-Twin combo for a while, but the speakers blew on me so that was history. Next was the Yamaha DG digital combo, great for the elusive semi-clean sounds. Last of all Line 6 combos. So I'm not adverse to embracing modern technology, it just didn't happen for me. "Anyone who knows me would tell you that I'm an FX pedal junkie. My FX board changes all the time in my pursuit of that Jimi tone." Custom 2x12" open-back cab, loaded with two Celestion Vintage 30 speakers. Do you have a favourite Jimi song: if so, why? "Bold As Love. A lot of songs mean a lot of things to people, but out of all of Hendrix's songs, this one gets me." Where do you get the 'Jimi' clothes? "I design most of my clothes and I get them made up by a seamstress - my mother! "I used to trawl around looking for '60s clothes but all I could ever find was Afghan coats reeking of patchouli and crocheted waistcoats." How many guitars have you burned? Isn't it rather expensive? "Really and truly, I've lost count of how many guitars I've burned. But it's a lot. 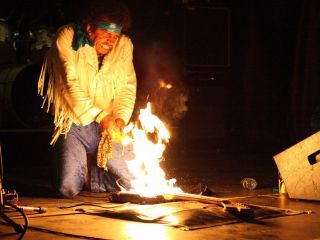 I try to recreate some of the excitement of what it must have been like at a Hendrix show, and burning the guitar - however many times I do it - always goes down a storm with the audience. "It can be a bit dangerous and I've burned myself a few times. But hey, no pain no gain." What do you think of Electric Ladyland next to the other two JHE studio albums and the numerous live and bootleg albums? "Electric Ladyland is well documented as being the type of record JimiHendrix wanted to produce, free from the restrictive three-minute song format he had been forced to adhere to by Chas Chandler. To me, it's a timeless classic. "Electric Ladyland was really diverse - soul, funk, blues, rock, ballads, psychedelic landscapes. It has it all." "Are You Experienced?, the first album, has some great songs. As does Axis (Bold As Love). But Electric Ladyland was really diverse in musical direction: soul, funk, blues, rock, ballads, psychedelic landscapes, plus a really cool album sleeve. It has it all. "I think it's unfair to compare a studio album to the raw live recordings. Hendrix, with the aid of Eddie Kramer in the studio, defied limitations and made the sounds inside his head real. I think it must have been very frustrating to try and produce the same things live in a three-piece format. "I think most Hendrix fans would agree that his best live performances were based on stunning guitar playing, showmanship and sheer volume. "His studio albums after Are You Experienced? were carefully crafted, multi-layered and painstakingly arranged and produced. "I just think it's scary to imagine what may have been next had he not died so tragically…"